Yes, I’m looking forward to the iPad release. I set my alarm early on Pre-Order day and raced through the process, just in case. I’ve been tagged as an Apple fanboy, but I’m not sure that’s the case. I’m a mobile technology fanboy. I’ve tried the gamut of mobile device models and brands, yet I come back to the Apple product lines time and again. I spent months with the Palm Pre (great SDK!) and weeks with Android (the Droid) and Windows Mobile devices, but the iPhone (despite its limitations) is #1 for me. Similarly, I’ve spent a lot of time with the Archos 5 Android, UMPCs, Nokia Internet Tablets and the Kindle. Knowing what I know about the software and hardware that makes up the iPad, it’s clear that Apple has another winner. I spend a lot of time on the computer. I read and write email, read and write documents, read news (twitter, articles), listen to audiobooks and podcasts, write code, watch video. At home and at work, I’ve been spending less time at my desk – so, for many of these tasks, I rely on my iPhone (especially reading email, listening to audiobooks/podcasts and watching video). 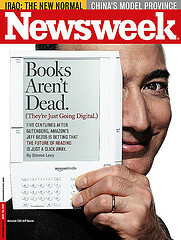 Going forward, at home I expect that the iPad will be my go-to device for reading and viewing email, news, and video. Meanwhile, there are a ton of new experiences that the iPad will enable. It’s not clear which of these will ‘catch on’ with me or with you, but quite a few new possibilities will be opened up on April 3rd at the intersection of the iPad and the terrifically innovative development community that has sprung up around the iPhone OS. The competition for the best iPad Twitter app – who can use the large, multitouch screen the best? I expect that it will be a more compelling experience than desktop/notebook alternatives. Similarly, but probably with a longer horizon, the competition for the best RSS newsreader on the platform will be intense. I version of Reeder 2 or MobileRSS reorganized for the iPad form factor will be a lot of fun to use. I’m still hoping that Netflix and Hulu will work something out with Apple to get their streaming solutions available on the iPad. Apple has an obvious financial incentive to block these apps, but subscription or ad based video streaming is going to win over $2.00 TV episodes some day. I’m surprised ANYONE is paying for TV that way on a regular basis. An iPad optimized Flickr browsing app would be interesting. Remote Desktop. It’s usable on an iPhone, but would be more so on the iPad. Games. Just as we saw completely new kinds of games with the iPhone (and the Wii and the DS), we’ll see some new things on the iPad. Comic books and graphic novels continue to be an exciting narrative model. It will be interesting to see the mix of mainstream and independent content that ends up on the iPad. Lots of people are excited about how magazines will make the leap to this device, but I think the leap that comics make will be just as interesting. Interactive charts and data visualizations via touch. This technique could bring new life to informative textbook and magazine content. LeapPads and the like have been around for a while. Put a specially configured booklet into an electronic pad. Tap a button or two with a special pen. Then let your child page through the booklet tapping on pictures and sentences to hear the story and learn the words. With Tag, the books themselves are printed on Anoto paper. The Tag pen reads tiny dots on the paper to know which book, which page and which word or picture is being tapped on. No need for a special electronic pad, just a pen and specially printed books. No need for special instructions, just tap. How is Tag better than current solutions? Well, nothing is better than a parent sitting with the kid, but this is better than the other electronic solutions out there because it’s easier to use and less bulky. I think this will be an effective tool for teaching kids to read who are much younger than the kids who are helped by the options available previously. Tag has another innovation. Plug the pen into your computer and the parent gets an interactive look at what their kid has been doing with the pen and how much he is learning. Nice! Links: LeapFrog Tag at Demo (with video), LeapFrog Tag official site, my 2004 review of the Logitech IO (also based on Anoto tech). I’m halfway through Bioshock on the PC (widescreenmod!) and William Gibson’s new book, Spook Country. Both are great so far. I’m also really enjoying this season of Eureka! I’ll be at the Naked Conversations Party tonight (hosted by Michael Arrington at his house). It should be a blast! Shel and Robert really did a great job on the book. I consider myself fairly knowledgeable when it comes to blogging, so I was surprised to find so many examples in the book that were new to me. And the examples I was familiar with were given strong, in-depth treatment, showing me the rest of the story. I finished it last night, so I plan to put together a review this weekend. At home, I haven’t had a lot of time to sit down, so I read half of the hardcover and had Microsoft Mary read the other half to me (using the Digital Edition). I used my laptop (booted to XP) and Adobe’s PDF Reader (with DRM) [Menu->View->Read Out Loud or CTRL-SHIFT-B]. Microsoft Mary is from the Microsoft Speech SDK. There were a few quirks (Read Out Loud doesn’t skip over urls in the footnotes and it mispronounces ‘Scoble’), but it was a pretty positive experience for my first time using text to speech so extensively. At least two of my coworkers own this book already. It’s a funny look at the techniques used in hundreds of scifi movies. Good stuff. That’s not why I’m posting about it, though. I skimmed Bruce’s comment section and found a reference to the Daleks in Doctor Who. No context, no explanation. Very few people(in the US) are going to get it – which makes the comment even more funny to me. In The Dalek Invasion of Earth (1964) a Dalek emerges from the waters of the River Thames, indicating that they are amphibious to a degree. Remembrance of the Daleks (1988) showed that they can hover using a sort of limited antigravity — first implied in earlier serials such as The Chase (1965) and Revelation of the Daleks (1985) — but their awkward forms still limit their mobility in tight quarters. Despite this, the Daleks’ supposed inability to climb stairs is still frequently referred to for humorous effect by journalists covering the series. The 2005 series episodes Dalek and The Parting of the Ways featured Daleks hovering and flying, the latter also showing them flying through the vacuum of space. In the Dalek episode, the Dalek said “Elevate” before hovering, in the same way it would say “Exterminate” before exterminating.